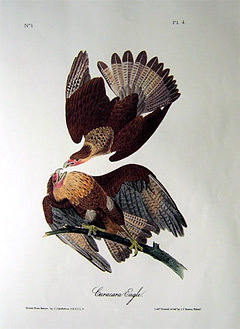 This hand-colored lithograph is Plate #4 from the Octavo Edition of Birds of America – created from 1840 to 1844. “I was not aware of the existence of the Caracara or Brazilian Eagle in the United States, until my visit to the Floridas in the winter of 1831. On the 24th November of that year, in the course of an excursion near the town of St. Augustine, I observed a bird flying at a great elevation, and almost over my head. Convinced that it was unknown to me, and bent on obtaining it, I followed it nearly a mile, when I saw it sail towards the earth, making for a place where a group of Vultures were engaged in devouring a dead horse. Walking up to the horse, I observed the new bird alighted on it, and helping itself freely to the savoury meat beneath its feet; but it evinced a decree of shyness far greater than that of its associates, the Turkey-Buzzards and Carrion Crows. I moved circuitously, until I came to a deep ditch, along which I crawled, and went as near to the bird as I possibly could; but finding the distance much too great for a sure shot, I got up suddenly, when the whole of the birds took to flight. The eagle, as if desirous of forming acquaintance with me, took a round and passed over me. I shot, but to my great mortification missed it. However it alighted a few hundred yards off, in an open savanna, on which I laid myself flat on the ground, and crawled towards it, pushing my gun before me, amid burs and mud-holes, until I reached the distance of about seventy-five yards from it, when I stopped to observe its attitudes. The bird did not notice me; he stood on a lump of flesh, tearing it to pieces, in the manner of a Vulture, until he had nearly swallowed the whole. Being now less occupied, he spied me, erected the feathers of his neck, and, starting up, flew away, carrying the remainder of his prey in his talons. I shot a second time, and probably touched him; for he dropped his burden, and made off in a direct course across the St. Sebastian river, with alternate sailings and flappings, somewhat in the manner of a Vulture, but more gracefully. He never uttered a cry, and I followed him wistfully with my eyes until he was quite out of sight. The following day the bird returned, and was again among the Vultures, but at some distance from the carcass, the birds having been kept off by the dogs. I approached by the ditch, saw it very well, and watched its movements, until it arose, when once more I shot, but without effect. It sailed off in large circles, gliding in a very elegant manner, and now and then diving downwards and rising again. Two days elapsed before it returned. Being apprised by a friend of this desired event, instead of going after it myself, I despatched my assistant, who returned with it in little more than half an hour. I immediately began my drawing of it. The weather was sultry, the thermometer being at 89 degrees; and, to my surprise, the vivid tints of the plumage were fading much faster than I had ever seen them in like circumstances, insomuch that Dr. BELL of Dublin, who saw it when fresh, and also when I was finishing the drawing twenty-four hours after, said he could scarcely believe it to be the same bird. How often have I thought of the changes which I have seen effected in the colours of the bill, legs, eyes, and even the plumage of birds, when looking on imitations which I was aware were taken from stuffed specimens, and which I well knew could not be accurate! The skin, when the bird was quite recent, was of a bright yellow. The bird was extremely lousy. Its stomach contained the remains of a bullfrog, numerous hard-shelled worms, and a quantity of horse and deer-hair. The skin was saved with great difficulty, and its plumage had entirely lost its original lightness of colouring. The deep red of the fleshy parts of the head had assumed a purplish livid hue, and the spoil scarcely resembled the coat of the living Eagle. I made a double drawing of this individual, for the purpose of shewing all its feathers, which I hope will be found to be accurately represented. Since the period when I obtained the specimen above mentioned, I have seen several others, in which no remarkable differences were observed between the sexes, or in the general colouring. My friend Dr. BENJAMIN STROBEL, of Charleston, South Carolina, who has resided on the west coast of Florida, procured several individuals for the Reverend JOHN BACHMAN, and informed me that the species undoubtedly breeds in that part of the country, but I have never seen its nest. It has never been seen on any of the Keys along the eastern coast of that peninsula; and I am not aware that it has been observed any where to the eastward of the Capes of Florida. The most remarkable difference with respect to habits, between these birds and the American Vultures, is the power which they possess of carrying their prey in their talons. They often walk about, and in the water, in search of food, and now and then will seize on a frog or a very young alligator with their claws, and drag it to the shore. Like the Vultures, they frequently spread their wings towards the sun, or in the breeze, and their mode of walking also resembles that of the Turkey-Buzzard. CARACARA EAGLE, Polyborus vulgaris, Aud. Orn. Biog., vol. ii. p. 350; vol. v. p. 351. Adult Male. Bill rather long, very deep, much compressed, cerate for one-half of its length; upper mandible with the dorsal outline nearly straight, but declinate for half its length, curved in the remaining part, the ridge narrow, the sides flat and sloping, the sharp edges slightly undulated, the tip declinate, trigonal; lower mandible with the sides nearly erect, the back rounded, the tip narrow, and obliquely rounded. Nostrils oblong, oblique, in the fore and upper parts of the cere. Head of moderate size, flattened; neck rather short, body rather slender. Feet rather long and slender; tarsus rounded, covered all round with hexagonal scales, the anterior much larger, and the five lower broad and transverse; toes of moderate size, scutellate above, the inner scaly at the base; the outer is connected with the middle toe at the base by a web, as is the inner, although its web is smaller; lateral toes equal, middle one considerably longer, hind toe shortest, and not proportionally stronger; claws long, arched, roundish, tapering to a point. Plumage compact, slightly glossed. Upper eyelid with short strong bristles; space before the eye, cheeks, throat and cere of both mandibles bare, having merely a few scattered bristly feathers. Feathers of the head, neck and breast narrow; of the back broad and rounded; outer tibial feathers elongated, but shorter than in most Hawks. Wings long, reaching to within two inches of the tip of the tail; primaries tapering, secondaries broad and rounded, with an acumen; the fourth quill longest, third scarcely shorter, first and seventh about equal; almost all the primaries are more or less sinuate on their inner webs, and the second, third, fourth, fifth and sixth on their outer. Tail long, rounded, of twelve broadish, rounded feathers. There is a large bare space on the breast, as in the Turkey-Buzzard. Bill pale blue, yellow on the edges, cere carmine. Iris dark-brown. Feet yellow; claws black. Upper part of the head umber-brown, streaked with brownish-black. Feathers of hind-neck and fore part of the back light brownish-yellow, mottled with dark brown towards the end. Back and wings dark brown, edged with umber. Primaries and some of the secondaries barred with broad bands of white, excepting towards the end. Tail coverts dull white, slightly barred with dusky. Tail greyish-white, with sixteen narrow bars, and a broad terminal band of blackish-brown, the tips lighter. Fore part and sides of the neck light brownish-yellow; the fore part of the breast marked like that of the back, the yellow colour extending over the lateral part of the neck; the hind part, abdomen, sides, and tibia dark brown; the lower tail-coverts yellowish-white. Interior of mouth and skin of the whole body bright yellow.